Following time in Fiat’s static simulator in Turin, on Friday 31 July 2009 Michael completed 67 laps of the Mugello track in the F2007 Ferrari. The car was Kimi Raikonnen’s former title winning car. 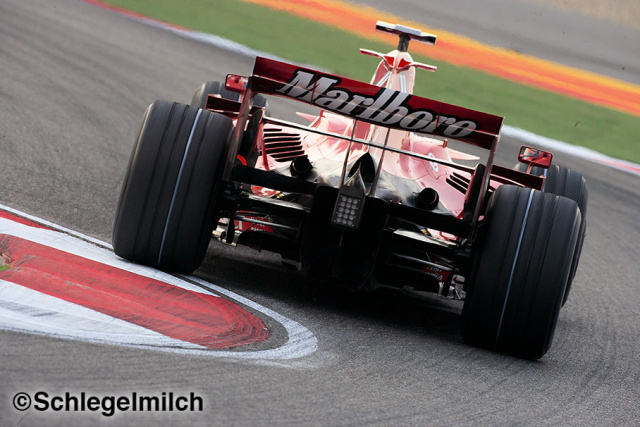 The 2009 rules preventing in season testing mean that Michael would not able to test the current F60 Ferrari F1 car prior to Friday practice in Valencia. Ferrari submitted an application to the other teams and the FIA asking if they would allow Schuey an exemption to test the car for one day before this date, which was subsequently blocked. In the meantime, an application was made by the German Motor Sport Federation (Deutscher Motor Sport Bund) for Schuey’s new FIA Superlicence. Schuey’s old licence expired at the end of 2006. This was expected to be granted as a formality, as he had competed in 15 grands prix within the past 3 years. A spokeswoman for the FIA confirmed, “Under normal circumstances Michael Schumacher should get a superlicense”.